I know you’re sick to death of pumpkin spice and still bitter about Daylight Savings time coming to an end, but Fall isn’t just about the endless raking of leaves and relearning how to weather the cold. It’s soup season, y’all! Time to drag the blankets and slippers out of the closet and enjoy a little something that warms you from the inside out. 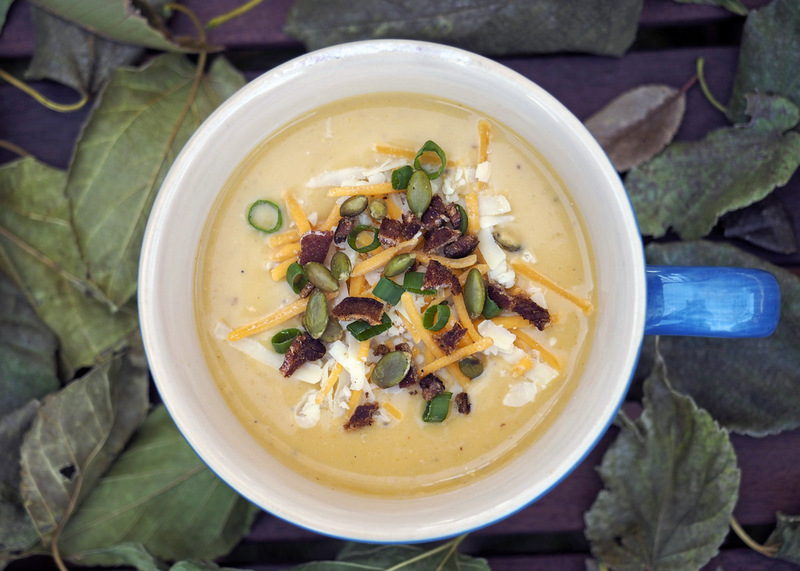 This recipe for Butternut Squash Beer Cheese Soup gives the classic brewpub dish a delightful fall twist. When choosing a beer for this recipe, go for something rich, malty, and warm. Stay away from anything too hoppy. 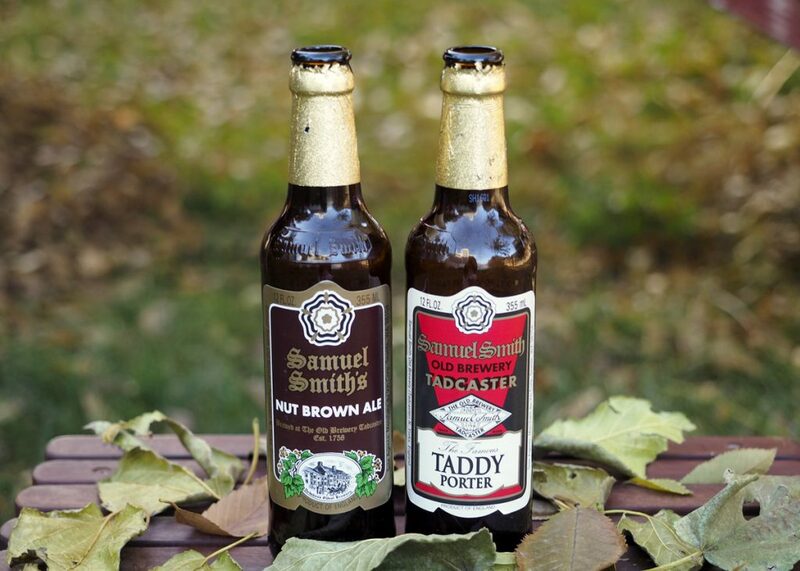 A porter is perfect, but a nut-brown or harvest ale would work too. I used Samuel Smith Nut Brown and Taddy Porter. I couldn’t choose so I mixed them. Cut squash in half lengthwise and scoop out seeds and pulp. Place both halves, flesh side up, on a baking sheet lined with tin foil and drizzle with olive oil. Use a brush to cover the flesh with oil, sprinkle with salt and pepper. Roast on a center rack in the oven for 1 hour, uncovered. While squash is roasting, start the soup. Heat a small amount of olive oil in a large soup pot over medium heat. 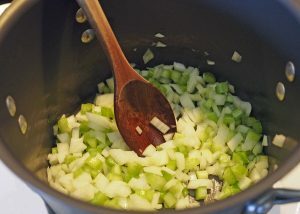 Add onion and celery and sautée until tender. Add a dash of salt and pepper, the garlic, and then cook until the aroma fills your kitchen. Add beer and chicken stock and bring to a boil. Reduce heat to a low-simmer, stir in mustard, add bay leaf, and cover. In a small bowl, combine cornstarch with some of the milk and whisk until smooth. Set aside. 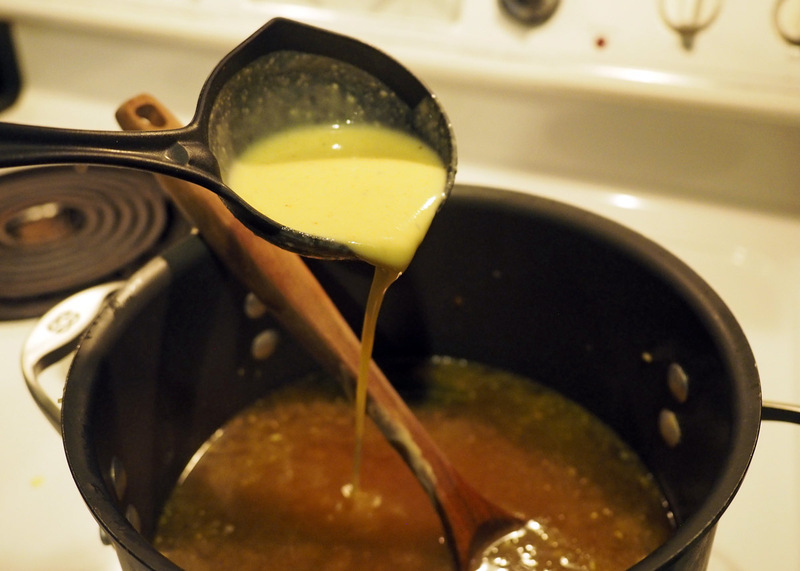 In a separate medium-sized pot, melt butter over medium-low heat. Slowly add flour while whisking to combine. Cook flour and butter for about a minute. Then, slowly begin to add milk and cream, continuing to whisk as you go. Add the cornstarch mixture. 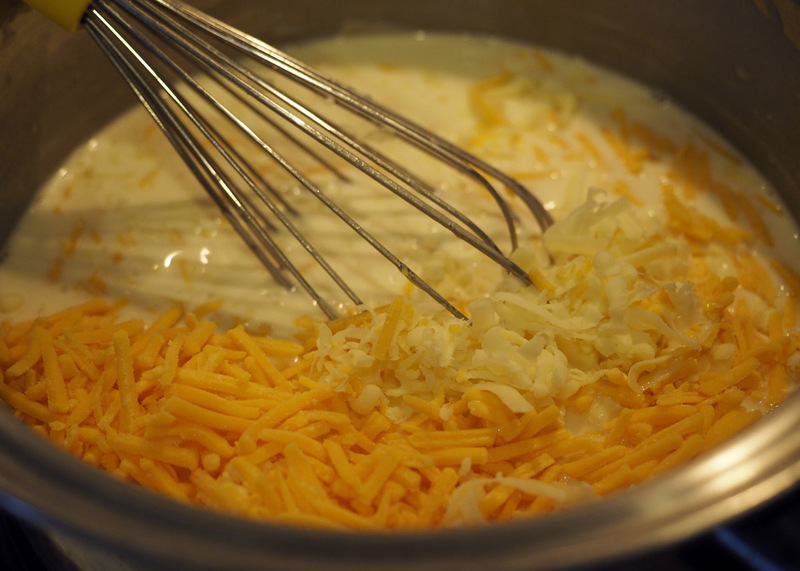 Add ¾ of the cheese, leaving some for garnish. Whisk until the cheese melts, and then season with a dash of salt and pepper and the rest of the seasonings. Make sure the soup is simmering, not boiling. Ladle the cheese sauce into the soup little by little, stirring continuously. 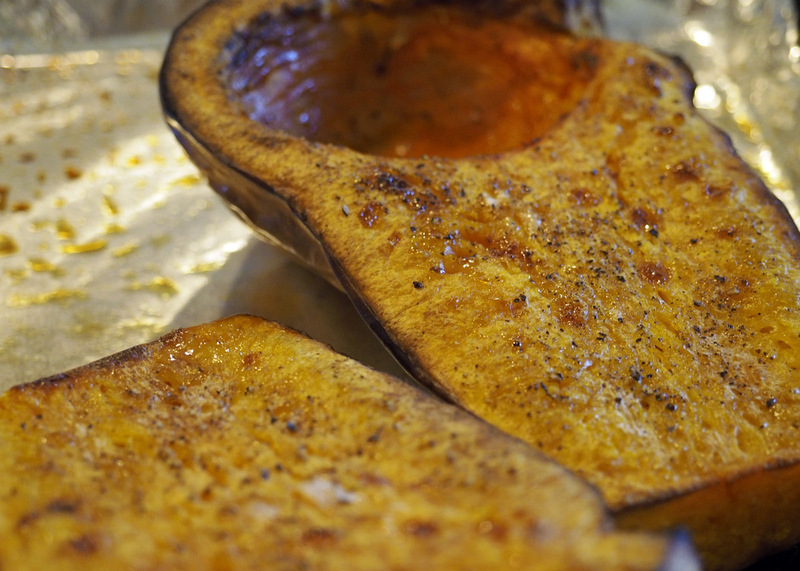 When the squash is fork tender, remove from the oven and allow to cool. Scoop the flesh from the skins and add to the soup. Remove the bay leaf. 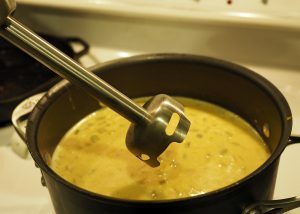 Using an immersion hand blender, puree the soup in the pot until smooth. Taste, and add more salt and pepper if desired. You can also use a regular blender or food processor, but soup is hot so be very careful transferring it. And seriously, buy yourself an immersion blender! Serve while hot with your choice of garnishes and remaining cheese. I’m really happy with how this soup turned out. I love the beer/cheese flavors, but I think the butternut squash adds a nice body to it. I added Parmesan bread sticks for dipping and soaking up all of that soupy goodness! 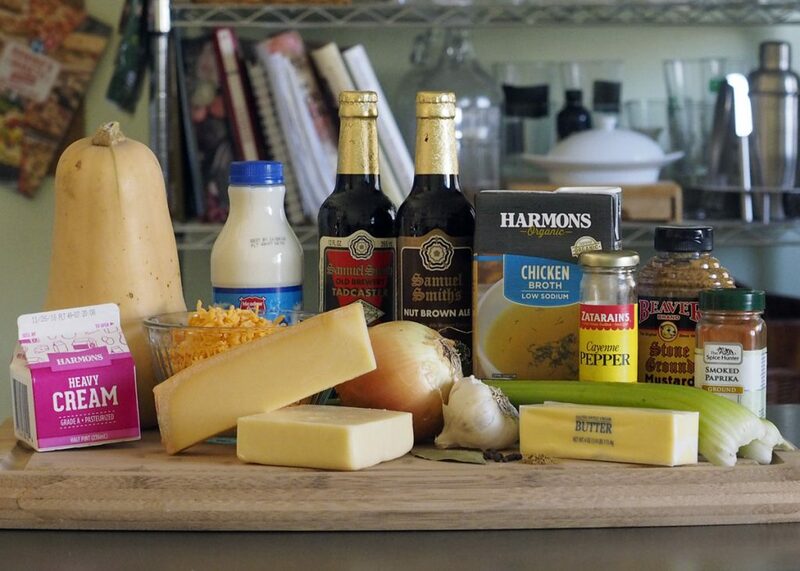 Be sure to buy an extra bottle of the beer you used in the soup for pairing with your meal. 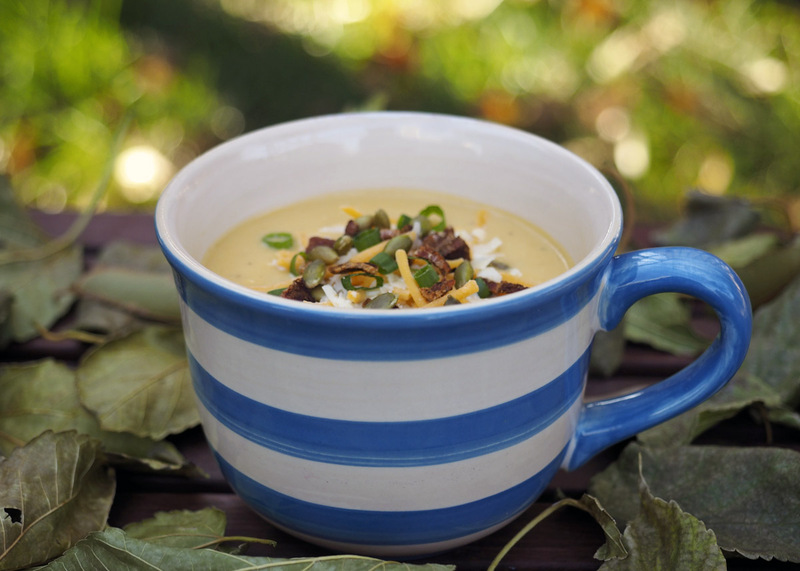 Butternut Squash Beer Cheese Soup would make a great addition to a holiday meal or a quiet evening at home on the couch.